It's time to turn the sewing machine off and get things packed up. I'm so incredibly thrilled to be heading to Houston for Quilt Market. It feels like the day my first book arrived from my editor's desk. The dream-to-reality affirmation is monumental, elevating all the other little wishes in line behind this. When the link for the Blend site goes live in the next few days (they are still fine-tuning), you'll see all the lovely collections. I'm so honored to be among these talented designers for the opening launch. There will even be a party! Thank you so much for all the kind words and cheers of support. Hoping to see you at the Blend booth over the weekend or back here next week. Now, I'm going to fill that cute tote with my stitching for the plane! I'm still having fun with my fabric. So many ideas, just not quite enough time. In between sewing projects, I made a little book about the collection to share, both in print and online. See it here. Last spring I designed a collection of fabrics for Anna Griffin's new company called Blend Fabrics. I've been hinting about the work, but not quite ready to show anything yet. Blend is launching at Quilt Market, now about 10 days away! Time to share. I am head over hills in love. With the whole experience, the company (and their inspired sense of adventure), the process, the prints, the quality, the colors. Oh, the loveliness! Named for the place where I grew up in Missouri, Walnut Hill Farm has seven patterns in three colorways: Button Box, Queen Anne's Lace, Rummy, Josie, Hilltop, Music Room and Dandelions. Of course, there are quilts for the booth, but I've been sewing a few extra things too. What a super-sized, happy dream come true! I'll be back to remind you again (and again), but if you or your local quilt shop is heading to Houston, you are invited to stop by Booth 1600-1606 to see all the artists' collections at Blend Fabrics. I'll be there and would love to meet you! For more information about the company, sales or the fabrics, please contact the wonderful Joe Spiegelberg, Anna's partner in Blend. Email joe@blendfabrics.com. I have a new bib project in the most recent issue of Mollie Makes. There is lots of excited buzz about this beautiful new magazine out of the UK with a digital version as well as the printed copy. Haven't seen the new issue yet, but I do love the apples on the current fall cover. 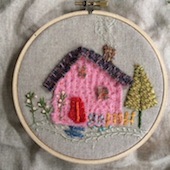 After the fun I had making the farm and this, I'm thinking about other little things to stitch. I like these projects that finish up in a short amount of time. Just relisted some of the ornaments I had in the shop last year. Still love those too.